Bespoke Bouquets is a unique and exclusive bridal bouquet design service, creating beautiful Bespoke Bouquets made from wonderful vintage brooches, earrings and buttons through to new sparkling jewellery mixed with Swarovski crystals, pearls and beads. Our luxurious bouquets are entirely handmade to order and can be made in a variety of sizes and colours to suit your style and taste. Our prices include the bespoke element of your design which ensures your bouquet will perfectly complement your gown, theme and personality. We can also wire in sentimental items of jewellery or buttons of your own to create a personalised memory bouquet which would be lovingly cherished for years to come, a long lasting memento. We can also work your “something blue” into your bouquet, making items as visible or invisible as you like. 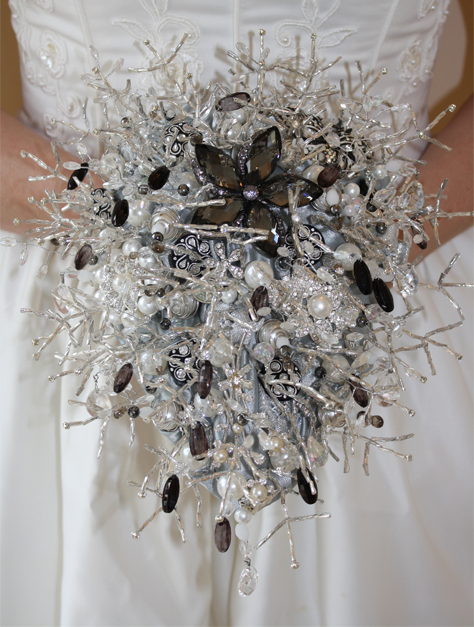 Brooch Bouquets cost from £250 and our Alternative Flower Bouquets start from £195. All prices are inclusive of P&P, for more options please see our Boutique. To discuss a commission email info@bespoke-bouquets.co.uk or use the form on our Contact Page to attach a photograph of your dress, for a no obligation quote.